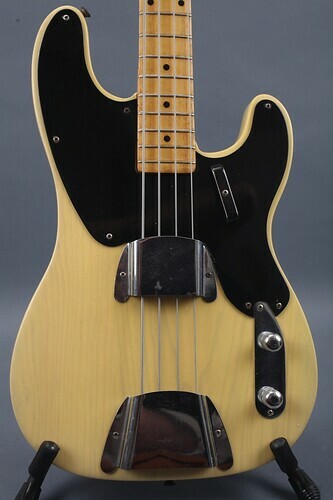 Last year I did a restoration on a 1953 Fender Precision Bass. 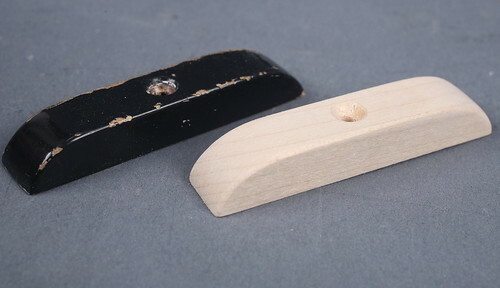 It was missing the single hole, wooden Tug Bar, so I made one for it (see below). Recently, for a restoration of a '55 Precision, I now need to do it again. But rather than make just one, I figured I'd make some extras and offer them for sale. This time, I also have the luxury of having a correct original part in my shop. They are NOT the same shape as the newer two hole plastic part, but they are close. The originals are made of hard rock maple, no doubt scraps left over from neck production. 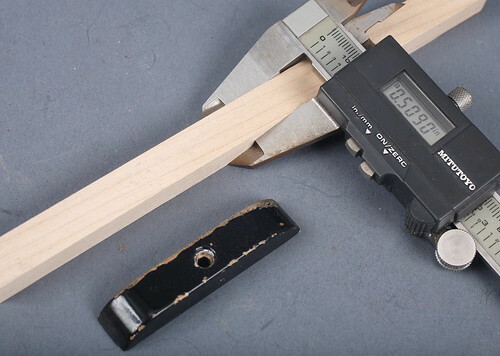 I first measured the original part. In broad terms it's 1/2" wide 3/8" tall and 2.5" in length. I made some stock in the correct dimensions using hard rock maple. 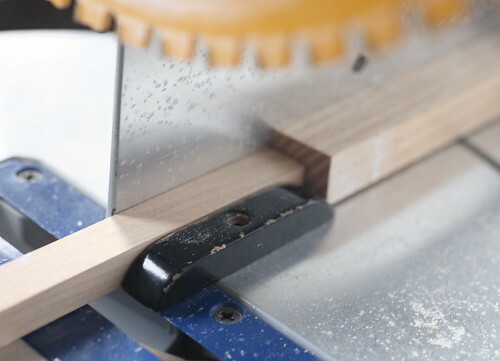 The saw is jigged to cut precise 2.5" lengths. 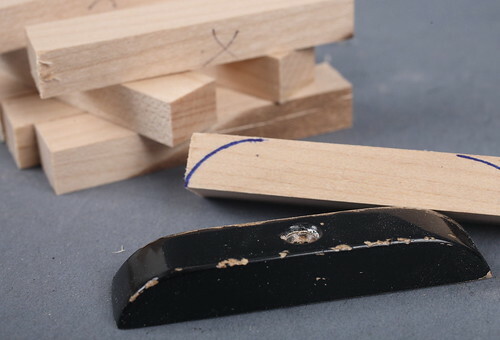 The raw Tug Bar pieces are marked for sanding using the original as a jig. The pieces are shaped by hand on the belt sander, then hand sanded to the final shape. 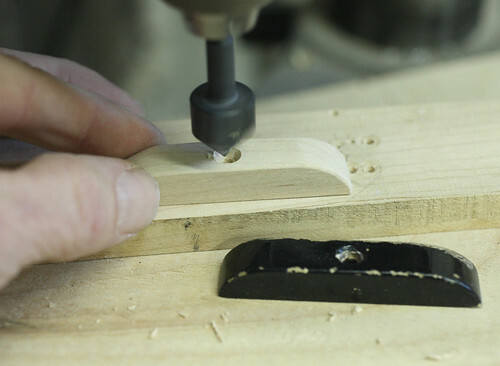 They are then drilled for the screw hole, then counter sunk. The original part is always kept close by for reference. Here is the finished piece ready for sealing, painting with black lacquer, then final aging. Next we apply a coat of black nitro lacquer followed by a coat of clear. 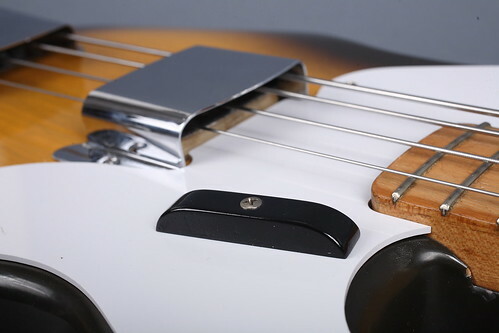 Here the finished tug bar is installed on Richard's '55 Precision Bass. Here is the restored '55 P sporting it's new repro tug bar. Do you still have any of these for sale?